Please, we beg you to turn off your ad blocker. Ad is the only way we earn a little money to run this blog (domain fees, time for managing and posting contents etc.). Please turn off your ad blocker and reload this page. The effectiveness of a data communications system depends on the following four fundamental characteristics. The system must deliver data to the exact destination. Data must not be received by other devices than the target device. The system must deliver data to the destination in a way that the target device receives the data accurately. If the protocol needs to alter the while in transmission, it must alter it back to its original form before representing it to the target device. The accuracy must be maintained. The system must deliver data in timely manner. Data delivered late can become useless. Data must be delivered as they are produced, in the order they are produced and without any significant delay. 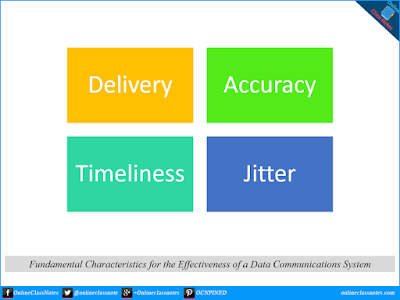 Jitter refers to the variation of packet arrival time. Data is sent as packets, that is, a fixed amount of the whole data is sent in each to turn. These packets get joined back in the target device to represent the complete data as it is. Each packet is sent with a predefined delay or acceptable amount delay. If packets are sent without maintaining the predefined delay then an uneven quality in the data might result. A former CSE student, working as a SSE with 5+ years of experience in the field of Web Application development in PHP+MySQL platform with strong skills in JS, JQuery(+UI), HTML, CSS, Bootstrap. Describe the fundamental steps of digital image processing with a neat block diagram. What is control unit? What are the functions of control unit? What are the steps followed by CPU in computer to Execute an Instruction? What is CPU in computer? What are the functions of CPU in computer? Write the differences between Isolated I/O and Memory Mapped I/O. What are the characteristics of computer?